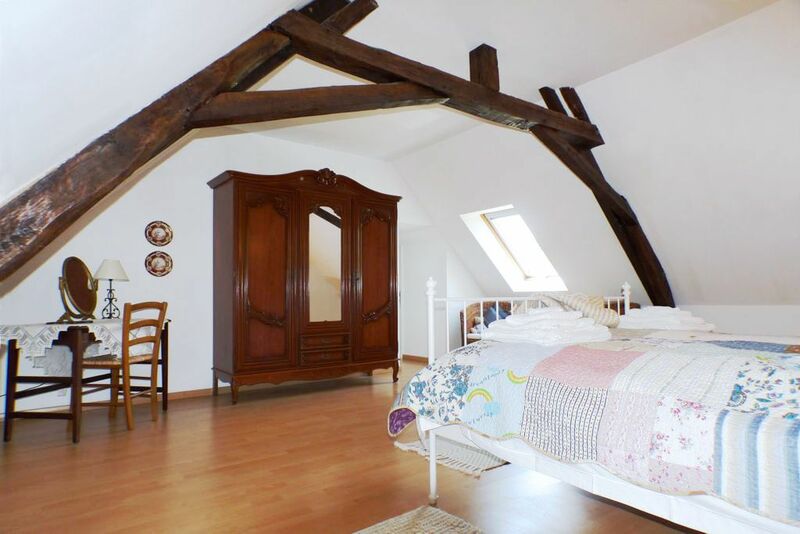 The master bedroom (28 square meters) on the first floor is big and has a high ceiling with exposed oak beams. The big metal bed is a generous continental king-size with a very comfortable mattress and pristine high quality cotton bed linen. The duvet and four pillows are filled with luxury microfibre and are therefore perfect for anyone with allergies or sensitive skin. Heating is by way of two modern radiators. There's a wood laminate floor with thick fluffy bedside rugs. 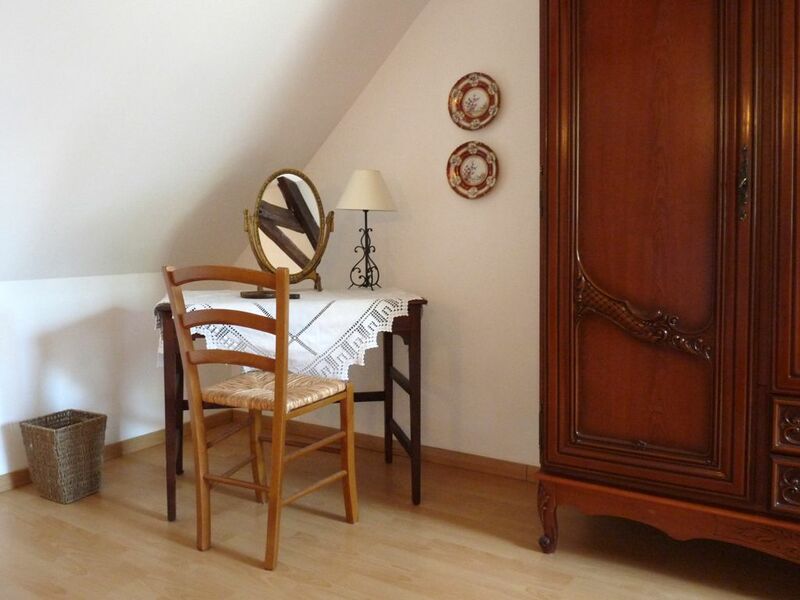 There's a big traditional French wardrobe with lots of storage space and hangers, a dressing table with mirror, a separate chest of drawers and two comfy wicker armchairs. 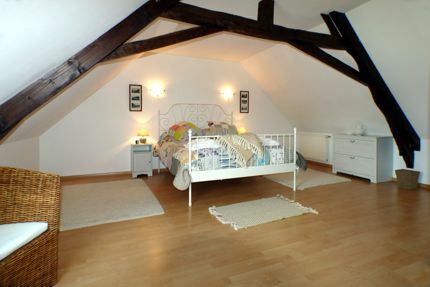 This bedroom is separated from the other two by the mezzanine (see the floor plan) so is nice and private. The view from the window is over the garden and fields and the bedroom cannot be overlooked from outside. The double glazed window has an integral blind. 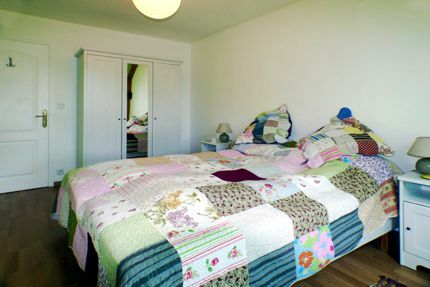 Bedrooms two and three (each 14 square meters) are very similar. Each has a comfortable continental king-size bed which can be converted into a pair of single beds (80x200cm) if appropriate. 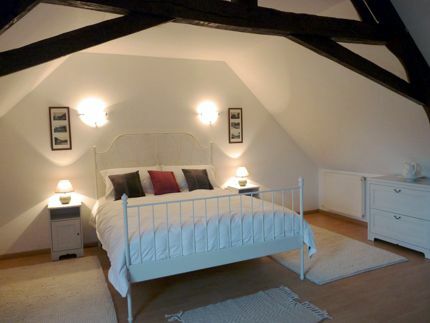 Both bedrooms have tranquil views over the garden and fields and cannot be overlooked. 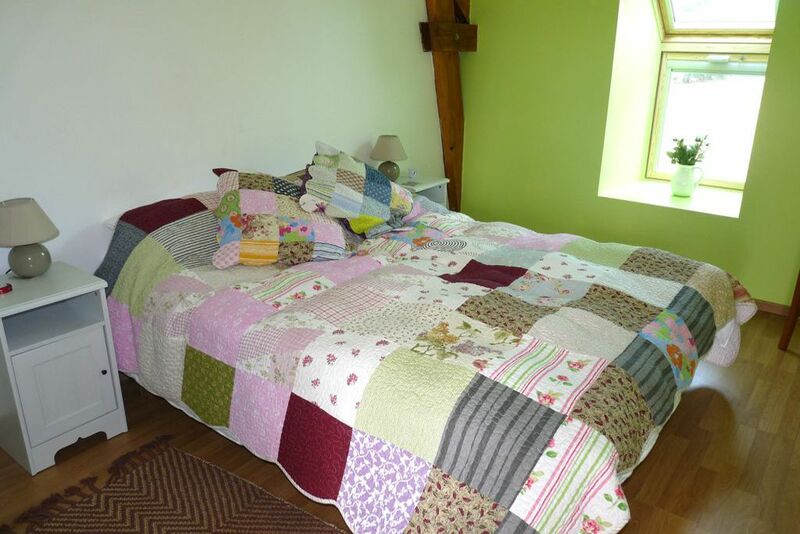 The double glazed windows have integral blinds and each room has a large wardrobe with hangers and under-floor central heating. Bedroom 2 has a built-in wardrobe (not shown) rather than free standing. 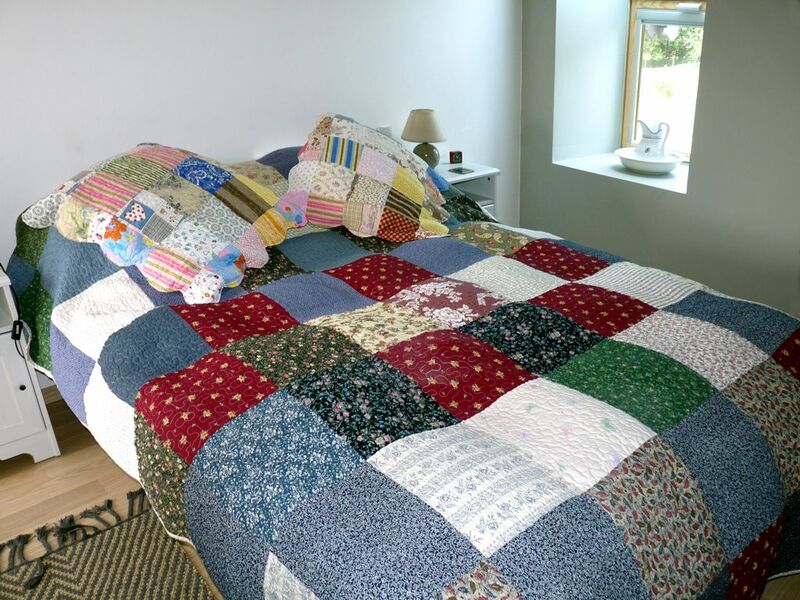 The white bed linen is high quality Egyptian cotton as per the master bedroom and there are beautiful patchwork quilts to add a touch of luxury. Duvets and pillows are filled with non-allergenic luxury microfibre like those in the master bedroom. Each bedroom has an electric fan and multi-way EU to universal power socket adapter. 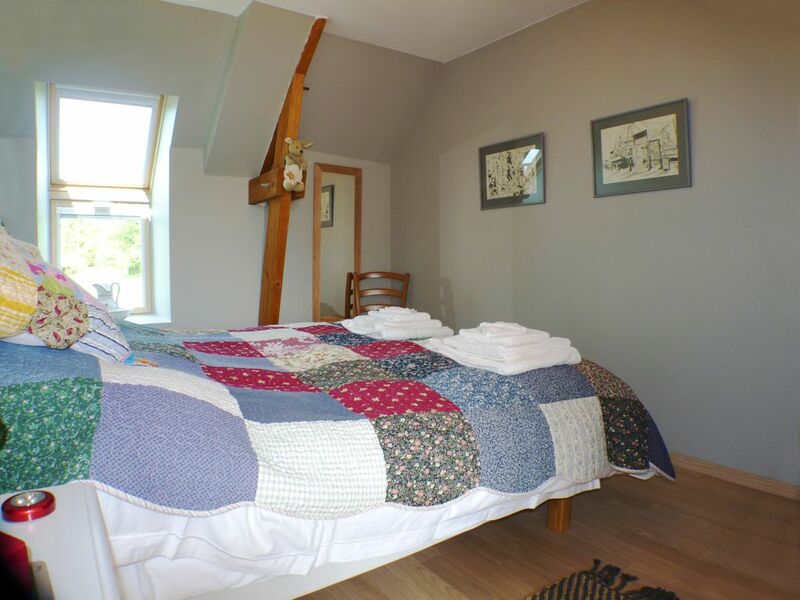 It's difficult taking decent pictures of these bedrooms without a wide-angle lens but the beds are big and there's plenty of space around them, so don't worry about that! Each room has two bedside tables with lamps, an alarm clock and a battery LED lamp, soft rugs and a full length dressing mirror. The floors are wood laminate. There is a dressing table with a mirror and hair dryer in the hallway just outside. These bedrooms, the shower room and the hallway are separated from the mezzanine by a door so can be made private if required. 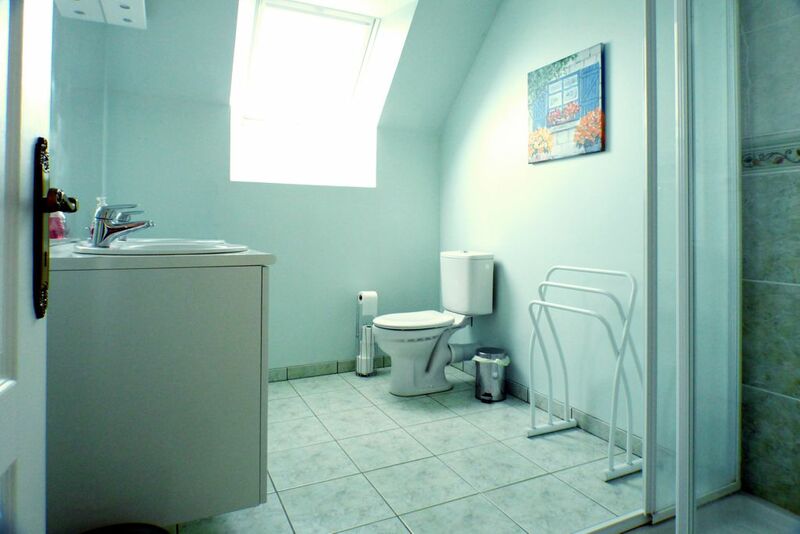 The shower room and toilet are practically en-suite to bedrooms 2 and 3. 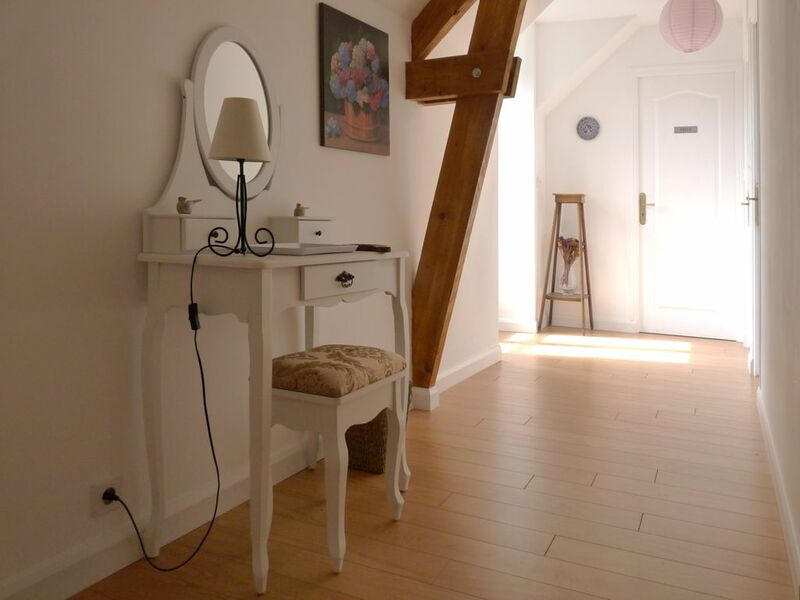 The bright and wide hallway immediately outside the bedroom doors has a dressing table with a comfy stool. There is a fully glazed French door with an integrated electric shutter which overlooks the courtyard and which can be opened to create a nice through draft.